An eccentric painter and poet from Kentucky, Faulkner's works are highly sought after by collectors around the country. 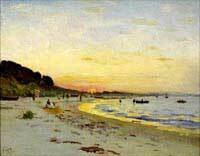 He exhibited regularly in New York, Ohio and Florida, and further developed his unique painting style while living in Sicily. Califano was born in Rome, where he studied under Domenico Morelli. He later lived in Chicago and eventually California. He won a gold medal at an exhibit in Naples in 1880, exhibited at the National Academy of Design from 1897-99, and at the Art Institute of Chicago in 1907. Bentley was an early member of the Woodstock Art Colony, and exhibited at the Buffalo Society of Artists. 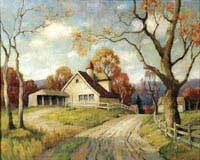 He was also a WPA artist, and his work is in several buildings in New York City and the Dutch Reformed Church of Woodstock. 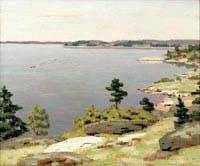 Listed painter and watercolorist of landscapes, oceans, fishermen, boats, and genre. Worked in Europe. Born in Lamberton, NY, studied in Boston but was mostly self-taught. Painter of New England pastorals and Adirondack mountain landscapes. Did calendar art. Father of artist Orson Lowell. 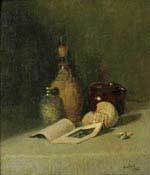 An art teacher at the St. Louis School of Fine Art at Washington University Gustav Goetsch was a student of William Merritt Chase and Frank Beckwith. 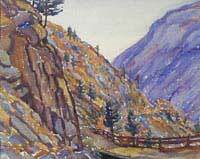 In the 1940s and early 50s, he painted landscapes in California. 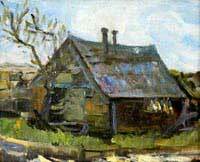 Stobart studied at Derby College and the Royal Academy in England. 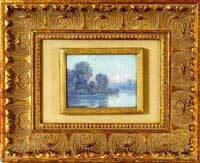 His maritime and historical paintings were in such demand that he started a printing company to make quality reproductions of his works. He has lived and worked in England, South Africa, Canada and America. 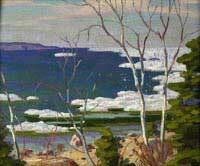 A musician and well-listed landscape painter, Sanderson studied with Scotch artist James Hope in Vermont, Samuel Gerry in Boston, and at the l'Ecole des Beaux Arts in Paris. In his later years, he spent his summers painting and teaching in Vermont and Michigan. 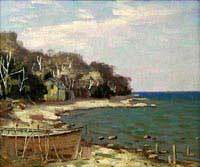 National Academy of Design member and co-founder of the Silvermine Artist Guild in Norwalk, CT, Hamilton Hamilton was a landscape painter and illustrator. He studied in Paris and worked with painters connected to the Barbizon School and the plein-air movement. Also worked with prominent American artists in New York. Listed portraitist, genre painter, illustrator and craftsman. Commissioned in 1933 to paint an Ascension scene in the Grace Episcopal Church in Queens, NY. Listed in Davenport's, Fieldings, Mallett, and Who Was Who.